We always think that it’s really cool when KaiNexus or one our staff members gets a shout-out from a publication. Recently, our CEO Greg Jacobson was interviewed by Beth Kutscher of Modern Healthcare. Modern Healthcare is the leading source of business and policy news, industry trends, and research in the healthcare industry. In addition to their online website, Modern Healthcare operates a print magazine, mobile products and hosts events in share the latest that goes on in healthcare. 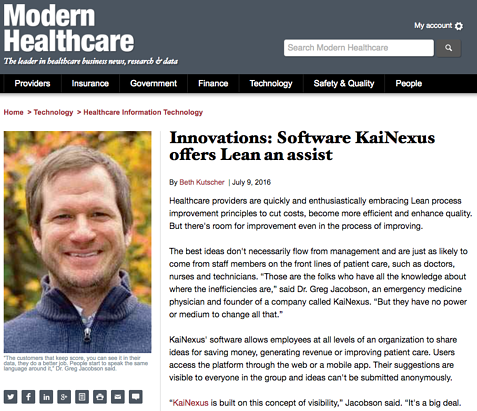 The interview shines a spotlight on KaiNexus, our awesome customer Mary Greeley Medical Center, and the growing number of healthcare professionals that supplement their Lean philosophy with the software technology that KaiNexus provides. Greg also gives some insight into how KaiNexus operates, shares some misconceptions about the technology, and some strategies that healthcare organizations use to get the most out of KaiNexus. We don’t want to spoil the whole thing for you! Check out Modern Healthcare at ModernHealthcare.com and read the full interview here.